As luck would have it, last week I had a full garden of zucchini blossoms, but this week, I have only zucchini! Not that I am complaining of course! So my plans for making zucchini blossom anything fell apart. 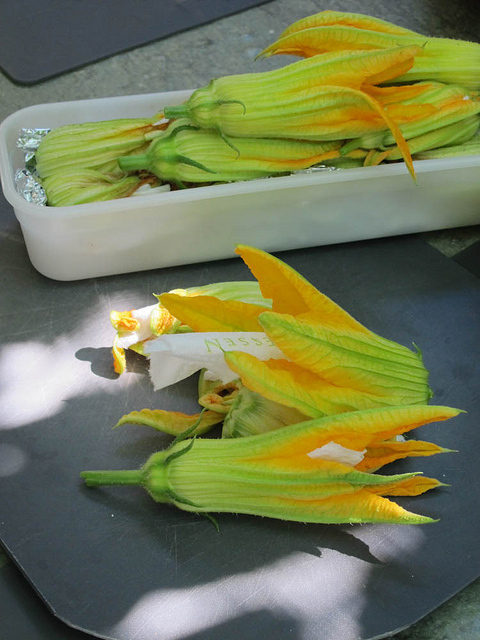 This French Fridays with Dorie, which was supposed to be Shrimp filled Zucchini Blossoms, but as I am not actually fond of shrimp, I had planned to make the Feta Filled Zucchini Blossoms that I learned how to make at Kea Artisanal in Greece. But since I was not able to get blossoms in time from the store, we’ll just revisit my time at Kea with Aglaia. 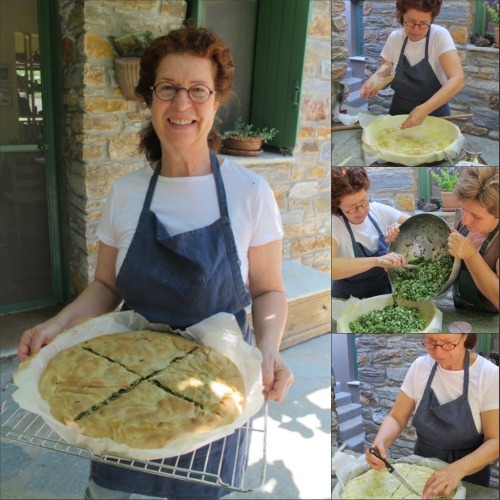 Aglaia Kremezi is a food writer, journalist, and one of Greece’s foremost cooking authorities and she runs Kea Artisanal with her husband, Costas, on the island in the Cyclades archipelago in the Aegean Sea. 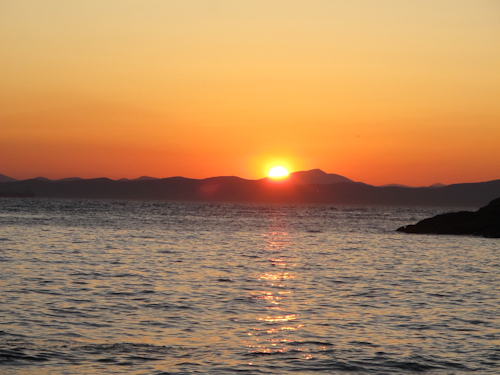 Kea is just an hour ferry ride from Lavrio, a port south of Athens. 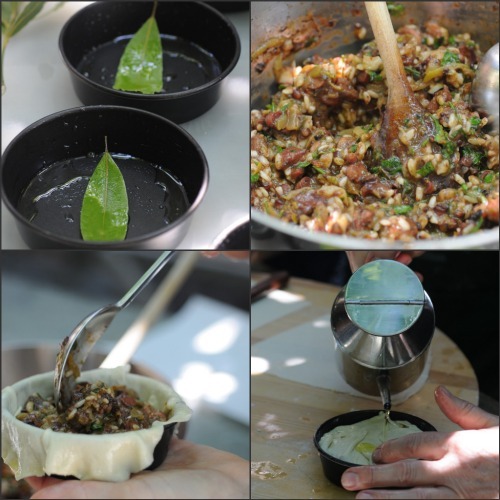 If you ever want to go on a culinary vacation to one of the most beautiful places on earth, and learn from someone who is truly able to pass along the techniques, history and traditions of Greek cooking, then you should visit Kea Artisanal. Their hospitality and their passion for teaching is exceptional. It was one of the best experiences I’ve ever had. 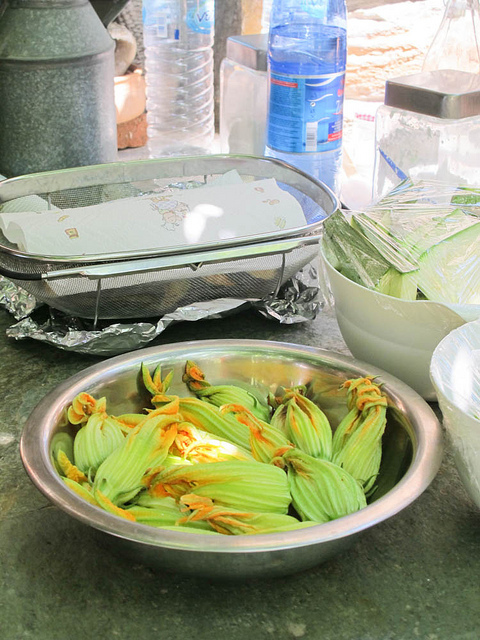 It was there that I was introduced to Zucchini Blossoms. I’d never had them before and the way we prepared them was so incredibly easy. Simply done, with a small piece of Feta cheese and a sprig of mint, then covered in a light batter and fried. On the side, we made a zingy potato-garlic spread, Skordalia to dip them and some other vegetables in to- and it was phenomenal! 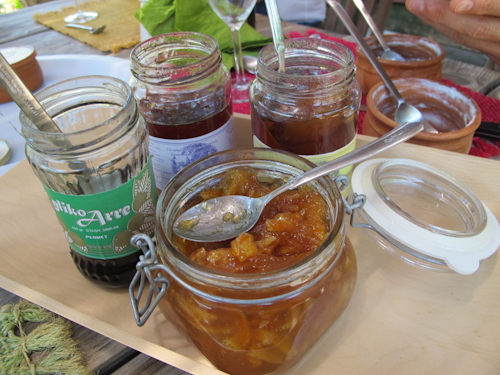 You can read the post about my Kea Artisanal trip and blossoms here. See more photos here. Then we filled each blossom with a small piece of Feta cheese and a sprig of mint, twisting the ends slightly to close the blooms. A quick dip in a light batter and into the oil it goes. 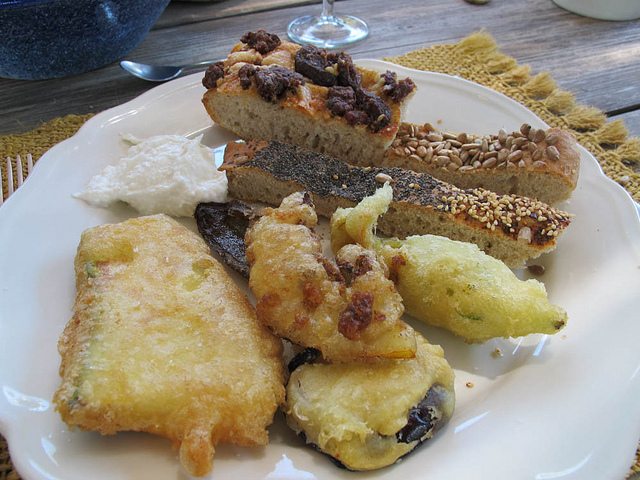 The finished vegetables, with flatbreads and Skordalia….. 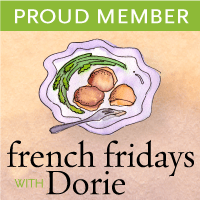 So while my French Fridays with Dorie this week was not really French, and not really Dorie (although the batter is the same for both recipes! ), it was great to relive my time on Kea and rekindle my fond memories of zucchini blossoms and Aglaia. While I was very sad to leave Kea, I was happy that I had one last night in Athens. 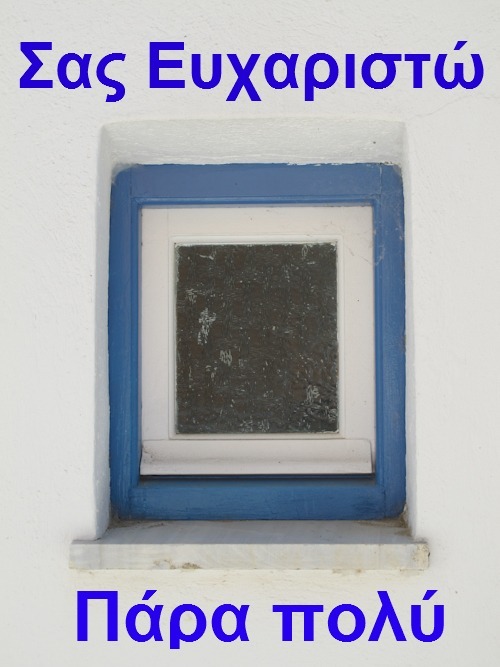 Aglaia and Costas had recommended a wonderful boutique hotel in the chic and cultural neighborhood of Kolanaki called The Periscope Hotel. It’s a member of the Yes! Hotels group, which stands for “Y”oung “E”nthusiastic “S”eductive. Each of their boutique hotels prides themselves on being creative but comfortable spaces with excellent customer service. 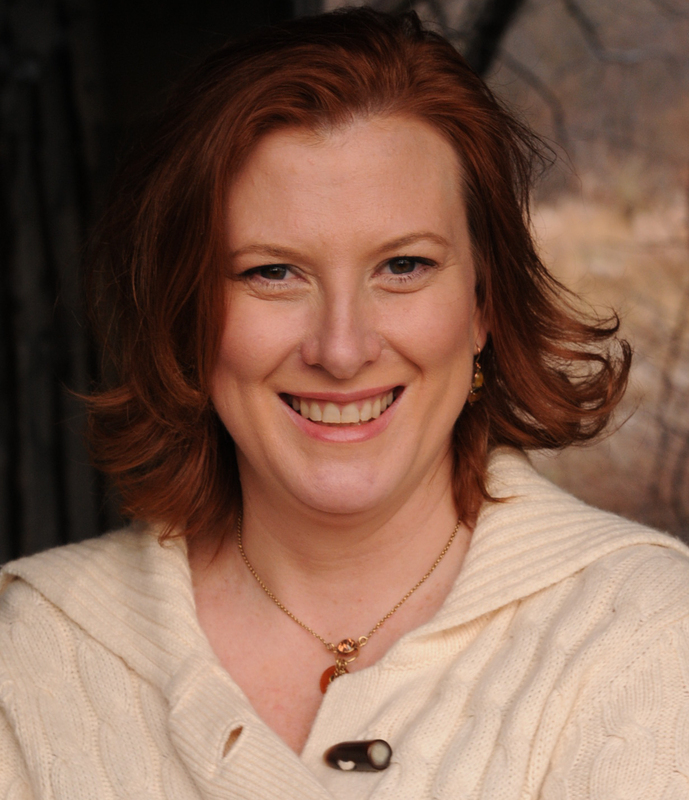 Aglaia said that the restaurant at the Periscope, π Box Eatery, was excellent and that the chef was doing very interesting things with the menu. So I was very excited to stay there and try out this restaurant. It did not disappoint! 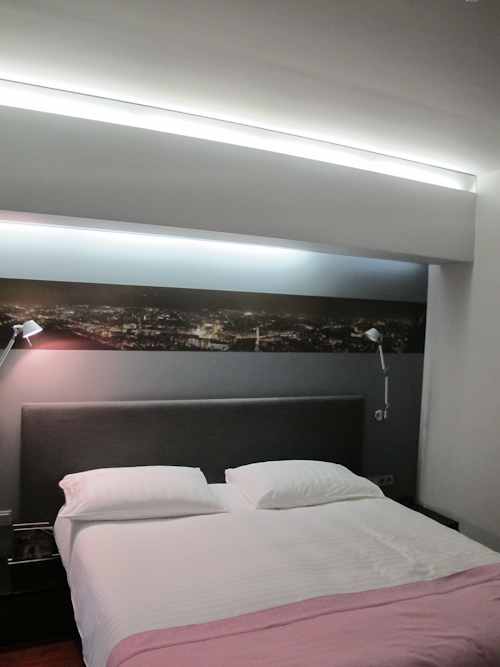 In keeping with the submarine theme, there are plenty of gray walls and steel accents throughout the hotel. For added fun, there is a video monitor in each hallway linked to an actual periscope on the hotel’s roof offering guests various vista views of Athens. But I wasn’t there just for the fabulous room and the submarine themed decor. I was really there for the food! The award winning and renowned Executive Chef, Christoforos Peskias, was born in Cyprus and studied business administration at Boston University. While he was a student, cooking became a passion for him and when he returned to Greece he worked as a chef at the Dash Restaurant in Kifisia. In 1992, he came back to the states to study alongside the famous chefs, Charlie Trotter and Jackie Pluton. For the next six years he worked in several kitchens, including Balthazar. But even more impressively, he returned to Europe and worked under such notables as Ferran Adria, Mark Menaux and Joel Robuchon. Influences of each can be seen in his menus today. From 2003-2008 he took over the kitchen at the now closed 48 Restaurant and garnered it a place on Restaurant magazine’s Top 100 list for both 2007 and 2008. In 2010 he opened the first Π box, in Kifisia, and recently, a second, smaller version at the Periscope Hotel where I would dine. I was thrilled that my new friends from Maine who had also spent the week on Kea wanted to come to dinner with me that night at the hotel’s restaurant. It was so nice to have such great company on my last night in Greece! When we arrived at 9pm there was only one other table dining. We were very early by Greek standards! But the restaurant soon filled and the room was buzzing. Our first server was not very familiar with the wine list and deferred our tasting questions to her manager, who found us the perfect crisp and fruity white wine to accompany our meal at a reasonable price as well. The eclectic menu had several fun titles for several of the dishes. We ordered three appetizers to share. 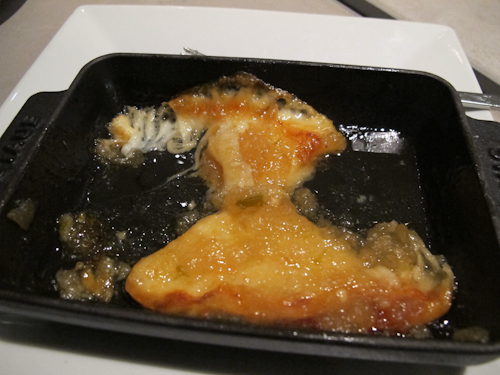 The first, “pan fried Ladotyri cheese with lemon marmalade from giam” was delicious! 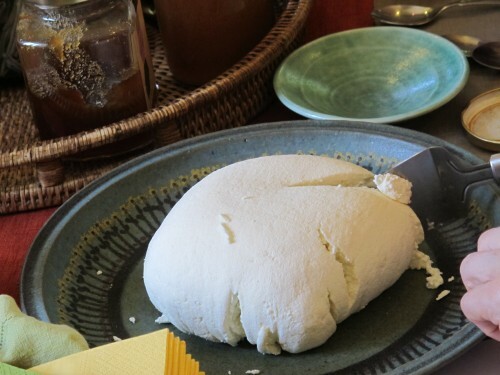 Ladotyri cheese is made from sheep’s milk or goat’s milk or a combination of the two. It’s a hard salty cheese that is stored and aged in olive oil. On it’s own, it has a very strong flavor but this melted version had a crispy crust of cheese with a gooey melted center and was a perfect balance of tart and sweet, made possible by the lemon giam (aka jam). It doesn’t look beautiful but it tasted amazing. I loved it! The next dish was entitled “street food of a different kind”. 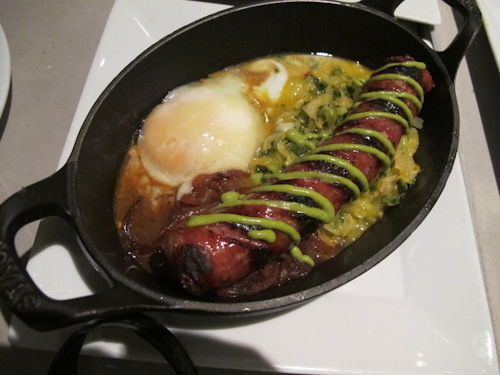 This dish is a take on Athens’s most popular hot dog cart at Mavili Square’s fare. Think a kraut dog, upped ten notches. This version is a mustard laced, slightly spicy sausage served with a savory stewed cabbage and a fried egg all together in one cast iron pan. We devoured it! 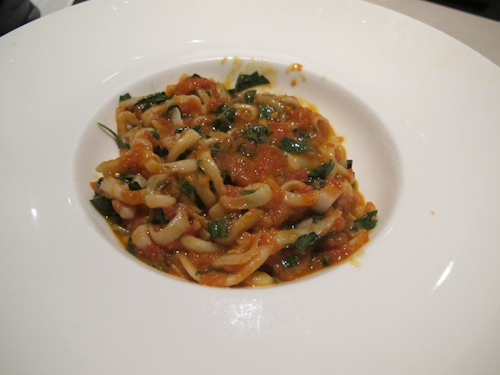 The third dish was calamari in a deep red zesty sauce. Then they brought us a few more appetizers to taste while we were waiting, a fresh tomato pizza bread and an Asian inspired cold chicken, rice noodle bowl. Both were quite good and had excellent flavors, but the fact that the chicken rice noodle bowl was actually a cold dish was a bit of a surprise. By the time our main course arrived we were rather full! One dish that was ordered was a “hamburger with three sauces”, a large American style burger served with three different sauces, each ranging in spice level. Two of us ordered the “Tandoori chicken with mashed potatoes”. I thought my chicken was a bit spongy to the touch and went to send it back for more cooking only to be told that it could not be cooked further. This was a bit shocking to me but the manager returned and assured me that it had been cooked thoroughly for several hours at a low temperature. Ah! Sous vide! Now it all made sense. The light bulb went off in my head. You see, restaurants in NYC are not allowed to use this method for fear of bacteria, so the only sous vide you can try is at home or in other cities and I must admit, I have not tried very many dishes prepared in this method. 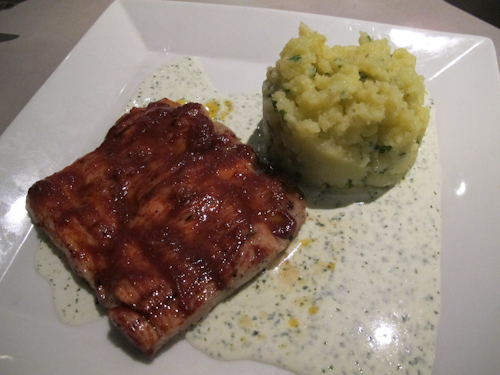 While not a visually appealing dish, this tender, juicy piece of chicken was coated in a tangy tandoori marinade and sat atop a fragrant and very flavorful yogurt and dill sauce which also served as the “gravy” for the mashed potatoes. Unfortunately, I was too full to eat the entire thing and had to leave a large portion left over. Feeling quite full and satiated, all of us agreed that we would bypass dessert and head out for a quick evening stroll around the neighborhood. The bill for dinner was very reasonable for the three of us with a bottle of wine. We found out that the menu changes daily so if you go, your menu may differ from ours. But if you see these dishes, be sure to try them! You will be happy you did! We then said our goodbyes and I retreated to my room for the evening and slept soundly through the night. The bed, while very firm, was incredibly comfortable, reminding me of memory foam and the pillows were soft but plump and offered a good amount of support. I had a great night’s sleep! In the morning, I was delighted to try the restaurant’s breakfast buffet that was included in the room rate. There was a large selection of cheeses and charcuteries, fresh fruit, cereals, grains and yogurts. There were also several loaves of homemade breads that you could slice yourself and a wide assortment of pastries, including muffins, croissants and bite sized baklavas. If a guest desired eggs or omelets, they could make a request and it would be made to order. From fresh juices to strong coffees and lots of varieties of foods, there was nothing that hadn’t been thought of. It was a good, solid breakfast to start the day. Unfortunately, my stay at the Periscope Hotel was short as I was heading to the airport to return home that day, so a shower and some packing was all that was left for me to do But I vowed to return, and I would certainly stay at the Periscope Hotel again or recommend it to anyone looking for a reasonably priced hotel in a great neighborhood. With the arrival of my new friend and driver, Loukas, to take me to the airport, my Greek adventure was sadly at its official end. I had the most amazing time there and am plotting how to return and next time, bring the family. 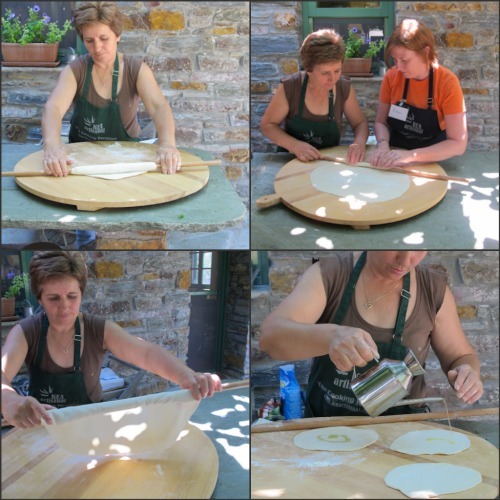 My week at Kea Artisanal was quickly nearing the end but not before learning how to make and roll phyllo dough. 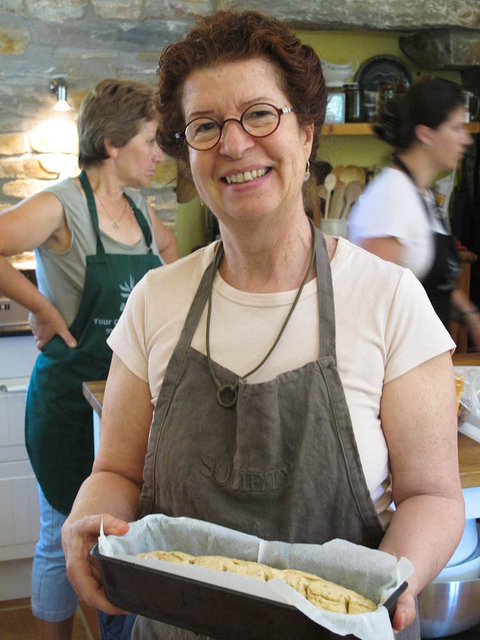 Stamatia, one of Aglaia’s wonderful assistants, is an expert on phyllo dough and patiently helped us each roll out the dough we had prepared. She made it look so easy! I think with many years of daily practice we might “get it” and perhaps be able to make the beautiful paper thin sheets as she did, but in reality, I doubt it! The ones she made were perfectly round, paper thin and made a slightly oily, but crisp crust for the greens pie we made to fill the dough. She was even able to roll three layers at a time by generously oiling each one then stacking and rolling them! That is true talent! Instead of spinach, as typically seen, the Spanakopita pie we made was filled with various greens that were available and freshly picked. I love that anything you happen to have on hand, Swiss chard, beet greens, dandelion greens or even arugula will make a suitable filling. 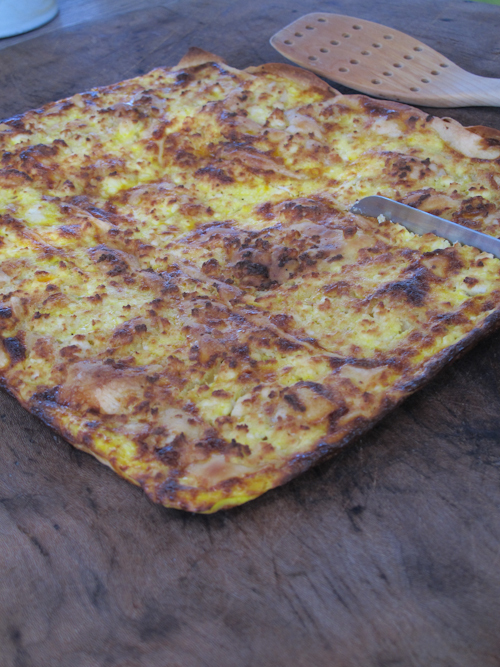 We also made a cheese and herb pie with an egg custard filling that resembled a flat quiche and some beautiful single serving marinated octopus pies that would be part of our dinner that evening. 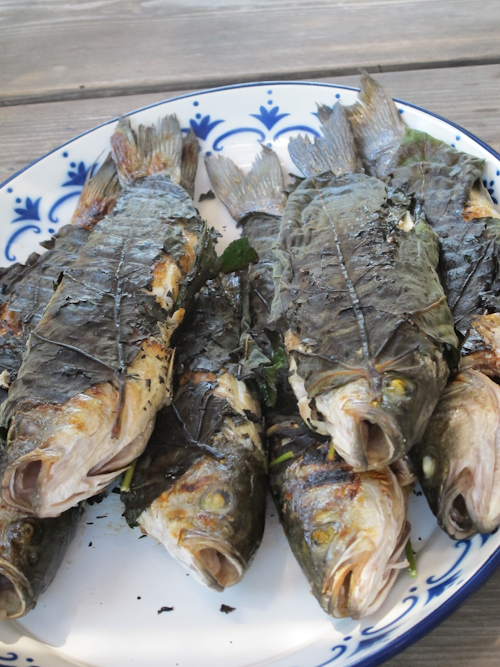 While the pies were baking, Costas prepared the fish that we had picked right off of the boat at the port that morning. 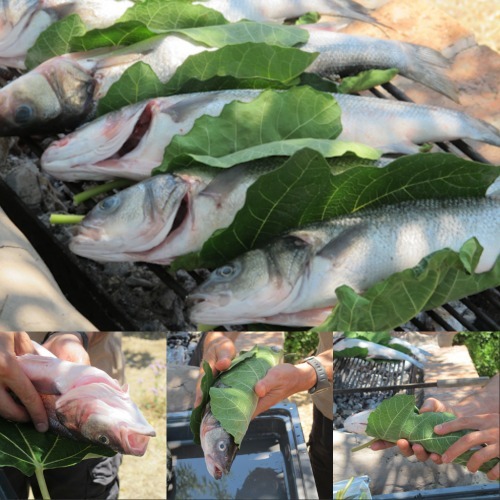 He wrapped each fish in a fresh fig leaf that had been oiled and placed the entire package on the charcoal grill, cooking it to perfection. The fig leaf provides a crispy, sweet and salty second skin. After our long, luxurious lunch, we were treated to a tasting of various spoon sweets. We enjoyed the interesting flavors of tomato, walnut, orange, cherry, apple and homemade lemon marmalade served with ice cream and yogurts. Each one was better than the previous one. I especially loved the lemon and the apple sweets. The afternoon was spent back at the hotel napping by the pool and relaxing before our sunset dinner and drinks at the beach. The sun sets at around 9pm so we were picked up at 7:30 and rode along the winding dirt roads along the narrow cliffs to the beach where we would dine. It was a bit harrowing as the roads are wide enough for only one vehicle and there is nowhere to pull over if you come across another car heading in your direction. One of you must go in reverse back the way you came to allow the other car to pass! There are also no guard rails to be seen and in some spots the road appears to be crumbling down the sides of the cliff. One wrong tire move and I could see the car tumbling off. But for the stunning beauty of the view, it might be worth it! I don’t think I could ever tire of such gorgeous vistas. Watching the sunset, sitting on the beach, eating the octopus pies, salads, breads and drinking wine was the perfect ending to the week. I could think of nothing I would have preferred doing for my last night on Kea. The next day, we had a cheese making class in the morning. 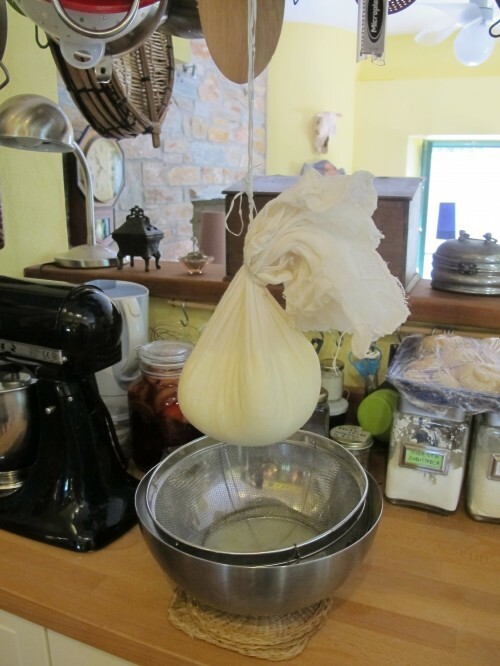 Myzithra, a Greek ricotta like cheese, is made from goat or sheep’s milk or a combination of the two and fresh cream. It’s simple to make at home and it’s soft, creamy texture goes well with honey, fresh fruits or even sliced tomatoes. We were given a selection of honeys to taste. Some of the varieties sampled included a carob honey which has a slightly nutty, but distinctively chocolate flavor; a chestnut honey, dark, thick and nutty; and my personal favorite, a heather honey. It had a rich floral scent and a strong intense flavor, a rung up from thyme honey which is more commonly found, but also flavorful. 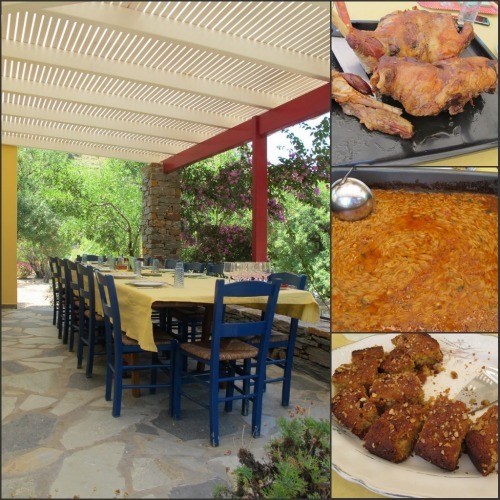 Our farewell lunch was held next door to Aglaia and Costas’ home at Ela’s, Aglaia’s other amazing assistant, and her husband Stathi’s home. 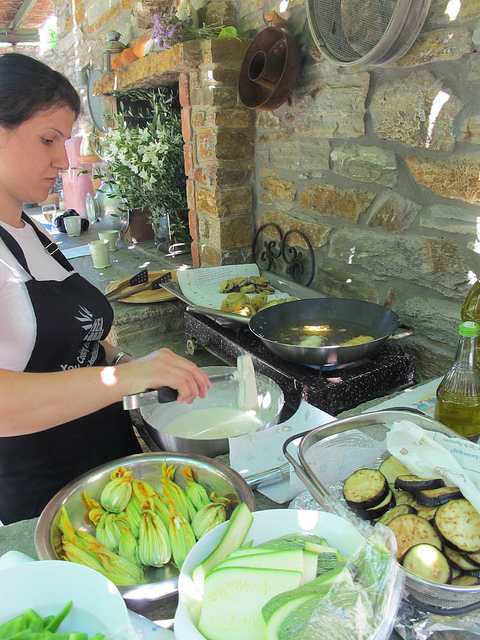 Ela served her pickled vegetables, a savory orzo pasta with tomatoes, homemade bread and several salads along with the meal’s highlight, a tender, free-range lamb that Stathi had roasted in a wood fired oven. For dessert, Ela had made a dense, sweet cake filled with walnuts and served it with ice cream. Her adorable children overcame their shyness by the time the ice cream came and joined us. Soon our taxi’s arrived to take us our hotel to pick up our bags so we could catch the ferry back to the mainland. They say “parting is such sweet sorrow” and I truly felt that way leaving Aglaia’s and Costa’s home. They welcomed us into their lives for the week, and into their home, cooking and sharing meals with them, laughing and telling many stories. It was the best experience I have ever had and I am forever grateful! I can only look forward to the day when I will be able to return.